This chapter will be concerned with the actual form and plan of a building or an agglomerate of buildings in a spatial setting. Any positioning of buildings in space (and time) can be a convenient tool to discover the cognitive setting of its builders. A person (or a group of people) has certain options when a barren area is occupied and the decision to live on the soil in a permanent way has been taken. Probably, it all started with nomadic tribes, putting their tents down where ever their cattle grazed or the hunting ground was promising. However, it can be assumed that even those mobile people used some sense to place their temporary dwelling, either around a fire or in a protective manner against the forces of nature. The physical existence of material constructions (or their remains) is – in the quadralectic approach – the realm of the Third Quadrant, characterized by empirical reality. Any scientific investigation, based on facts, has to start here. What do we see and how did it get there? —————————- 3. Aiming at beauty (venustas). A building falls short of its expectations if one of these characteristics is missing. Vitruvius expected an architect to be ‘a good writer, a skilful draftsman, versed in geometry and optics, expert at figures, acquainted with history, informed on the principles of natural and moral philosophy.’ He also had to be ‘somewhat of a musician, not ignorant of the sciences both of law and physic, nor of the motions, laws, and relations to each other, of the heavenly bodies’ (De Architectura). The three-division and the attention to the material and durable already indicated the scope of Vitruvius’ and Palladio’s work: they were both ‘Third Quadrant’-architects, living in the third part of this particular quadrant (III, 3). The principle of the ‘historic resonance’ was mentioned in respect to Vitruvius and Cesariano, the translator of his book. It holds even stronger for the architect Andrea Palladio, who modeled his book after Vitruvius’ authoritative writing. Vitruvius (ca. 70 – ca. 20 BC) and Andrea Palladio (1508 – 1580) lived in the same subdivision of a major cultural visibility period, as established by a twenty-first century observer. The former belonged to the classical Roman presence, visible from 750 BC to 500 AD (see fig. 88). The third part of the Third Quadrant of the Roman cultural period lasted from 125 BC to 1 AD and included Vitruvius’ lifetime. 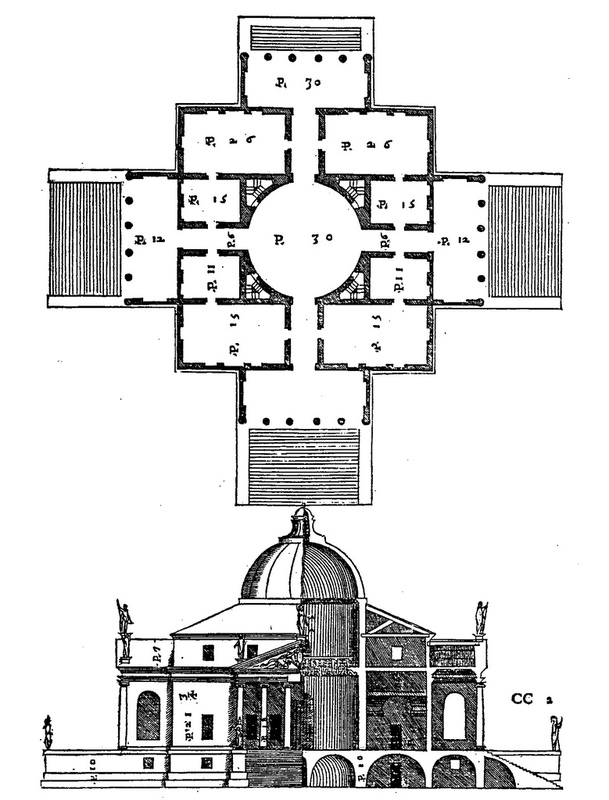 Palladio lived in the European cultural period, which is visible from 750 – 2250 AD (see fig. 267). The third part of the Third Quadrant (III, 3) of the European cultural period lasted from 1500 to 1650 AD and covered the physical presence of Palladio. Both writer/architects, although living some sixteen hundred years apart, found themselves in a resembling perspective as far as current division thinking was concerned (fig. 504). This situation, in a psychological context, was earlier called a historic resonance. The expression suggests that a similar position on the CF-graph leads to comparable creative inspiration. Fig. 504 – The comparison between the position of the life of the Roman architect and writer Vitrivius (ca. 70 – ca. 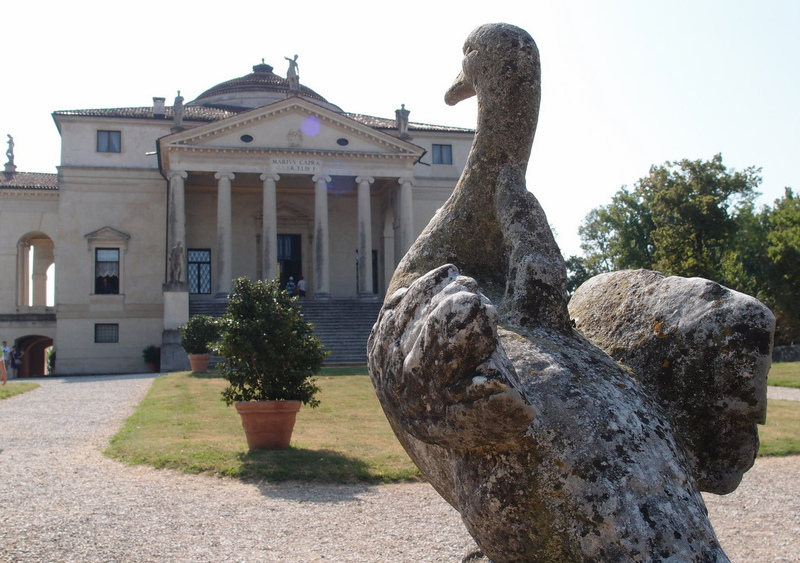 20 BC) and the life of Andrea Palladio (1508 – 1580). They both lived in the third part of a Third Quadrant, respectively of the Roman (upper dating) and European (lower dating) cultural history. 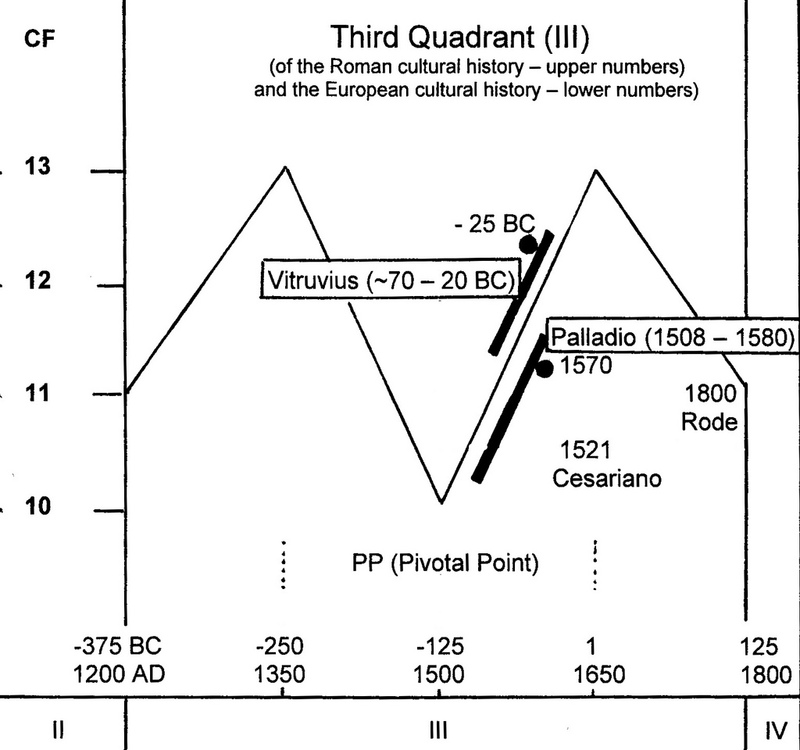 The temporal positions of the original book ‘De Architectura’ by Vitruvius (20 BC), Cesariano’s illustrated edition of 1521, Palladio’s ‘Four Books on Architecture’ (1570) and the date of Rode’s edition of Vitruvius’ book (1800) are given on the CF-graph. Palladio’s ‘Four Books of Architecture’ were specific – although in detail fairly brief – when it came to a description of building materials (Book I, Chapter 1 – 9). The basements, floors, the size of rooms, windows, staircases and the roofs were briefly indicated. He treated these matters in his First Book (Book I, Ch. 8, 21 – 29), which also comprised the classical Five Orders (of column design): Toscan, Doric, Ionic, Corinthian and Composite order. The Second Book of the ‘I Quattro Libri dell’ Architettura’ is about design plans and drawings of private houses (villas), and their internal organization (fig. 505/506). He freely recombined elements of Roman buildings. The aim was a construction with harmonious proportions. Simplicity is in this stage of the utmost importance. Villa Capra (or Villa Rotonda) near Vicenza (Italy) is probably his best-known creation and an archetypal example of tetradic building. The actual building took place around 1567. Fig. 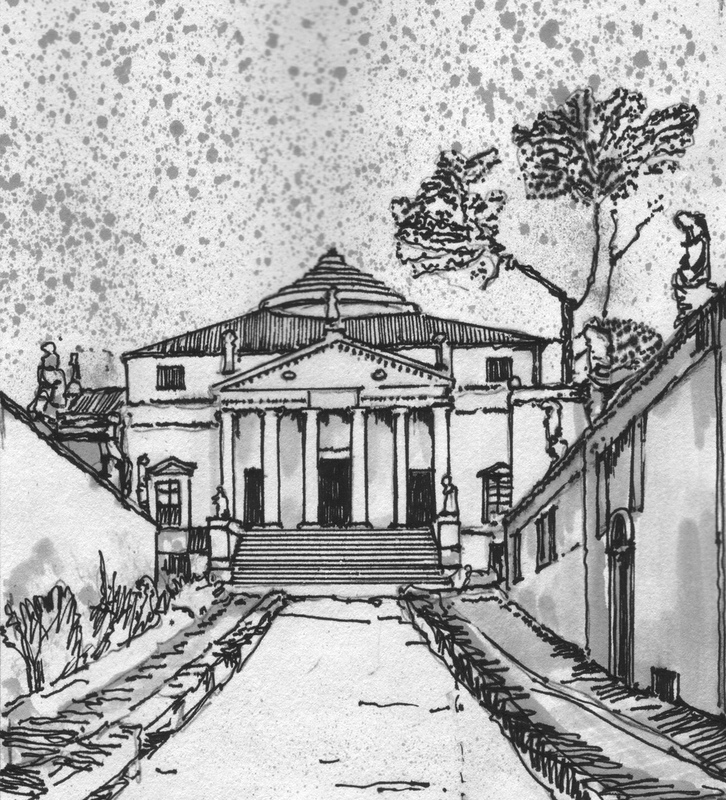 505 – Th Villa Rotonda or Villa Almerica by Andrea Palladio is a prime example of tetradic architecture. The engraving was given in the second book of his ‘I Quattro Libri dell’ Architettura’ (1570). Fig. 506 – The Villa Rotunda outside Vicenza (Italy), by Palladio, shows four loggias, which ‘enjoys the loveliest views on all sides’ and ‘give the effect of an enormous theatre’. (Drawing by Marten Kuilman). Villa Rotunda in Vicenza (Photo: Marten Kuilman, 2011). The Third Book is centered on usefulness or utilitas (functionality). The description contains short notes on streets, bridges, squares and basilicas. His measurements are taken with a ‘Vicentian Foot’, consisting of twelve inches. Every inch was (sub) divided in four minutes. The figures twelve and four might point to some sort of four-fold preference, but the numerical outcome does not find a response in the objects of measurements. These findings could point to two things: either the original measurements of the old buildings were performed with another basic unit or there was no intention to work with a fixed ratio in the first place. Palladio, in any case, does not refer to any sort of pre-established proportions and gives no hind to the relevance of his measurements. He only observes. Streets have to be short, functional, secure and pleasant. They have to be wide enough ‘to let an army pass without obstruction’. Military roads should avoid possible points of ambush or advantage points of an enemy (this emphasis is, in a modern view, a typical Third Quadrant outlook). Bridges are clearly Palladio’s specialty and he gives some examples of his own design (‘they are beautiful in my opinion’). The (town) squares (Book III, Chap. 17 and 18) are often in a quadratic form, at least in the Greek past. The Romans also preferred elongated squares with the length/width proportion of 3 : 2. The subject of town planning is totally absent in Palladio’s work. Finally, in the last book of the ‘Four Books on Architecture’, Palladio played his master card of knowledge and interest. Book IV is solely dedicated to the temples (and one baptistery), because ‘without a belief a civilization cannot exist’. The element of decoration, as a dedication to Vitruvius’ third point of beauty (venustas), becomes more important. He described the temples of Mars Ultor (Ch. 7), Nerva Trajanus (Ch. 8), Antonius and Faustina (Ch. 9), Sol and Luna (Ch. 10), and the Pantheon (Ch. 20) in Rome. In addition, some temples outside Rome (Vesta in Tivoli (Ch. 23), Castor and Pollux in Naples (Ch. 24) and Nimes (Ch. 29) were reviewed and illustrated. The Baptisterium of Constantine (IV, Ch. 16) is, according to Palladio, not old at all, but consists of the debris of antique buildings. The Four Books suggest a concern with the fourfold, but there is hardly evidence that Palladio had a special interest in the multiple way of thinking (or building). The quantitative indication in the title of the Four Books seems to be a number, nothing more and nothing less. However, his short style and urge for illustrations, drawings and other explanations is familiar to someone with a high regard for visibility and an intention to share his views with others. Palladianism, although full of attention to the four-fold, cannot be regarded as being a specific dedication to the tetradic spirit (or quadralectic outlook, for that matter). The ‘classical’ harmonious proportions are often based on a two-fold symmetry, with mirror planes. Palladio had no preference for four, six, eight or higher divisions given that they could be divided by two. A temple could be round, quartered, with six, eight or more corners, in a cross or many other forms as long as a dual symmetry was applicable. This type of (dual) symmetry finds its origin in a dual mind, where (equal) opposites are of the utmost importance and provide a base of comparison. It has been noted before (fig. 504) that Palladio (1508 – 1580) was born just after the Pivotal Point in the European history (1500) and his work bears all the characteristics of the freshly gained visibility after that historic point in time. His search for analogy with the classical Roman principles of building (Vitruvius) must not be seen as an act of copying, but rather as a conformation of his own architectural discoveries. Representation is typical for the Third Quadrant, but it occurs in other places of a communication as well. In fact, most of the lasting impressions of a communication are produced much earlier, i.e. around the First Major Approach (FMA), which is the boundary between the third and fourth part of the Second Quadrant. The CF-values are low (CF = 6), pointing to the fact that the communication is near its ‘roots’ and has the greatest ‘depth’. The only drawback – from a general-historic point of view – is the state of relative unconsciousness in which these representations are materialized. The pyramids of Egypt are probably the best example of such a decisive representation in an early state of development. Architectonic representation is a wide subject, which includes all types of building on an individual or collective scale. The basic approach should emphasize an awareness of the position of the observer. The present investigation will focus on the organization of form in the realm of the visible invisibility (Fourth Quadrant). The growing complexity of the multitude is, at the same time, associated with greater simplicity when the right (intellectual) tools are used. The evolutionary path from individual houses to a neighborhood, city and metropolis (and back again) provides a source of interaction, which can only be understood, when its forms are integrated in a wider comprehensive framework. Form, in a philosophical sense, is rooted in Plato’s belief that the material world is not the real world and refers to the essence of the object. Form and Idea are in the Greek philosophers view, closely related (Greek: eidos), and are both non-physical entities, outside the mind, with no spatial dimensions. This dichotomy became the major source of criticism, in particular by Aristotle (in his ‘Nicomachean Ethics’). Aristotle called the ‘Theory of Forms’ a demonstration of ‘idle chatter’ in his ‘Posterior Analytics’. Form, in a quadralectic context, should be approached from four different angles, associated with the various degrees of visibility. The relation between the Form and the environment, in which the Form is supposed to exist, is the first point of attention (1). The relative importance of this caesura depends primary on the choice of division thinking, as Plato found out during his life. The opposition increases in lower division thinking and the more the form (idea) and the environment (universe) are separated, the further their contents will be removed from the convergent understanding of higher division thinking. Form as an idea (2) is closely linked to Plato’s original intentions of this entity as a psychological unit (as given in various dialogues (like Cratylus, Meno, Parmenides and Phaedo and in the books 3, 5 – 7 of ‘The Republic’). The concept has to do with vision and the sight or appearance of things. The Form is, in Plato’s view, the essence of the object and points to perfection. The quintessence of his philosophical deliberations with regards to the form was an effort to come to grips with the nature of limitations. This ‘fight’ for boundaries takes place in the Second Quadrant and becomes an empiric reality in the Third Quadrant. The (Platonic) Idea of a pure, unitary Form is in the quadralectic philosophy renamed with a neologism and is now called a ‘muun’ or a multi-unity. This psychological unit is not particular ‘pure’ and cannot be the ‘ultimate’ unity (or perfection), because it is ‘formed’ after a division took place. Its position in the quadralectic setting (of the CF-graph) is in the third part of the Second Quadrant (II, 3). Further details of the philosophical nomenclature and background can be found in Chapter 7 of this book. Form as an intentional shape (3) is found in the Third Quadrant as an individual form. This individuality should be defined as a Part, i.e. an object that is separate from the universe by a boundary. This boundary is, in turn, positioned in the context of a division of the universe. The latter sentence is very important, because it means that although the Part of the Third Quadrant, just like the Idea of the Second Quadrant, is a single item in itself, it is also ‘ruled’ by the type of division thinking, which is applied in the communication. The perceptual valuation of an architectonic form, as it is generated from a building, group of buildings or a wider urban setting, depends largely on the type of division thinking, which is used by the observer. The multiplicity of forms (4) is situated in the operational field of the Fourth Quadrant and exhibits all the characteristics of this quadrant (the whole). The organization of forms, as shown in models and plans, becomes more and more important and starts to live its own life. It is in this very segment of the communication (between observer and form) that quadralectic architecture feels at home and reaches its best performances. Fig. 507 – The main processes and their components of a (quadralectic) communication are given here in a cyclic interaction. Division and movement are general indicators for processes, which create respectively a number and a shift in an otherwise omnipresent and continuous universe. Form and function are derivatives of the subjective valuation, which could take place when division and shift are determined. The unity and the part are entities in a static First (I) and Third (III) Quadrant, while the ‘muun’ and ‘whole’ have similar status in a dynamic Second (II) and Fourth Quadrant (IV). Opportunitas in large public projects, like markets, buildings for civil servants and government (palaces), (amphi) theaters, sport facilities, waterworks (fountains, aqueducts) and harbours. The three-division covers – in a quadralectic setting – respectively the First and Second (religio), Third (defensio) and Fourth Quadrant (opportunitas).